It’s ages before the next Bromsgrove Festival in June and July next year, so why am I writing about it more than seven months in advance? The reason is that there are many talented, artists, musicians and performers in our area who might want to get involved – and now is the time to plan. The Bromsgrove Festival organisers want to send out this message to us all: “Why not get involved?” Until a couple of years ago, many of us associated Bromsgrove Festival quite narrowly with classical music, but that was then. . . In fact Bromsgrove Festival has been going for 55 years and was originally established in 1960 as a vibrant celebration of the arts and culture in their broadest sense, hosting many performers and artists of world renown. In recent years, under the directorship of Dr Mary White, Bromsgrove Festival celebrated mainly classical music with some excellent musicians in stunning venues. The Young Musicians’ Competition has been an important part of the festival and continues to be so. Then, two years ago, there were great changes for Bromsgrove Festival. A new committee took over the Festival organisation and moved it back from its fairly narrow classical music programme to its original approach of a much wider range of events. Happily, the baby wasn’t thrown out with the bath water in that the high quality classical music, for which the Festival was well known, is still there and is bigger and better than ever. What has been reintroduced is a wide range of theatre, art, poetry, literature, dance, and art and craft events. Musical events have also been broadened out to include opera, folk, jazz and other genres. The 2014 and 2015 Festivals have been really successful with increased visitors, participants and audience numbers as well as an increase in the general buzz around town. 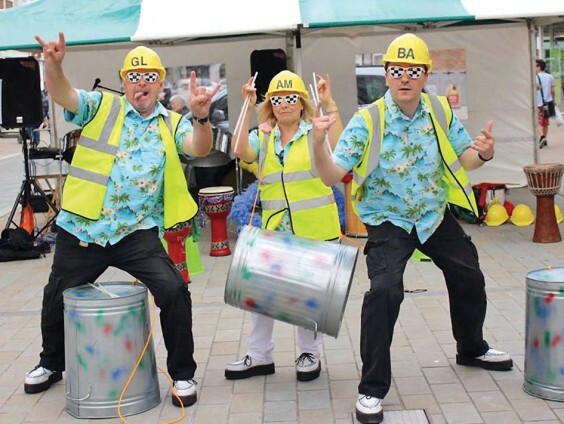 Importantly in 2015, the Festival organisation formed a partnership with Bromsgrove District Council to ensure that on all six Saturdays during the Festival, the High Street was used to the max – not just the Carnival and Court Leet procession but music, circus acts, street theatre and dancing on the street! If you have a band, are in a dance group, want to exhibit your art or craft work with a group (or you know someone who does) and you think you are ready to show the world, get in touch with the organisers via the website. They are happy to be contacted and are looking for new people to take part in next year’s Festival. You can talk about your ideas, receive advice from experienced participants – and still have months to get your act together! In 2016 the Festival runs from June 18– July 24, so why not get involved? * For those interested in ceramics: Birmingham Museum & Art Gallery presents 20th Century British Studio Ceramics, running until Dec 31. Movement exhibition by Birmingham Art Circle – a large group of professional artists all exploring the starting point “movement”; and Mountains & Moorlands – paintings, prints and sculpture by eight RBSA members. Looks like a really awesome exhibition by a very talented group of artists.